President Donald Trump on Monday. They said it again on Sunday: The White House accused thousands of Massachusetts residents of busing into New Hampshire to illegally vote on Election Day. Trump said it Thursday to a group of US senators in a private meeting, and White House Senior Policy Adviser Stephen Miller reiterated that accusation during media interviews over the weekend. This fraud, Trump and his staff have argued, is why he lost New Hampshire by around 3,000 votes, and US Senator Kelly Ayotte, a Republican, lost her reelection by an even slimmer margin. To be clear, Trump and his allies have provided zero proof of this claim. Let’s take a closer look at how these rumors have persisted for so long. Republicans’ claims about voter fraud in New Hampshire began in the 1990s, after two major changes in local politics. First, New Hampshire began to offer same day voter registration under under then-governor Steve Merrill, a Republican. He viewed it as a way to save the state money under new federal voting regulations (known as the Motor Voter Act). Secondly, Democrats started winning races in New Hampshire, a long-time GOP stronghold, for the first time in 100 years. At the time, some -- but not all -- Republican activists and elected officials believed that there was a connection between the those two events. But there’s some solid logic as to why Democrats ascended: In the early 1990s, the national GOP was becoming more socially conservative and religious -- a departure from the more libertarian philosophy espoused by New Hampshire Republicans for decades. Also, a legal scandal rocked New Hampshire Republicans in 2002, and a couple officials went to prison. It crushed the state party’s organization for more than a decade. During that time, the Democratic Party became more professional: they raised more money, hired more staff, recruited more candidates. Privately, Republican operatives concede this is why Democrats started winning. It’s also one of the reasons why last month, for the first time, the New Hampshire Republican Party voted to allow their new chairman to accept a salary. Not that we know. The word “fraud” suggests that someone did something illegal. But there have been no proven claims about wide-scale voter fraud, according to officials all over the state, from the Secretary of State’s office to the Department of Justice. So how are New Hampshire Republicans reacting to Trump’s claims? There are basically three camps: Longtime professionals like former state attorney general Tom Rath and Republican National Committeeman Steve Duprey (both have said the voting fraud accusations are baloney). There’s a group of Republicans who privately say they know the accusations are not true, but they are putting their head down and trying not to get involved. Finally, there’s a small contingent in the party’s base who argue that fraud exists. Let’s take seriously that last group for a moment. This group often cites the state’s same day voter registration law as ripe for abuse. They believe college students from other states take advantage of a weirdly worded law that allows them to vote in New Hampshire if they have a government ID and say they intend to live in the state. They point to the large, same day voter registrations in college towns like Durham and Hanover, which heavily favor Democrats. 2. Those who just look at Durham and Hanover are cherry picking the election’s results. The statewide totals are what matters, and Republicans actually had more people register to vote on or around Election Day than Democrats did! 3. None of this has anything to do with Trump’s original claim that accused Massachusetts residents of busing into New Hampshire. 4. If the buses ever did arrive, it is hard to see how there would not be evidence. Local Republicans have been talking about this for decades and have been on guard. There were Republican poll watchers at nearly every polling place looking for irregularities. Also, anyone with a smartphone could snap a picture of a bus dropping off new voters. 5. If... if... if... the buses crossed the state line, they had to be super sneaky and strategic. The voting patterns county by county were pretty consistent with previous elections. So where is the Trump getting all of this? He might be hearing it from former US senator Scott Brown. Remember how Miller, the White House aide, said he worked on a New Hampshire campaign? Well, Miller came up for the final two weeks of Brown’s US senate race in 2014. Brown has said that one reason he lost to US Senator Jeanne Shaheen that year is because buses filled with people came up from Massachusetts to vote. He’s repeated that accusation as the reason why Trump lost New Hampshire in 2016. Brown, of course, endorsed Trump ahead of the New Hampshire primary and claims to be in frequent contact with Trump officials, possibly including Miller. One thing to keep in mind: Ayotte has said she doesn’t believe voter fraud was the reason she lost by roughly 1,000 votes. Brown lost by more than 15,000 votes. Where does this issue go from here? As mentioned above, New Hampshire Republicans are looking to change the state’s same day registration law. A new bill under consideration would require a person be a state resident for 13 days ahead of Election Day to be able to vote. But on the specific accusation about the buses in 2016? In New Hampshire, the wheels have long come off that reasoning. Trump’s plan to revive US steel industry faces barriers from Annie Linskey in the Boston Globe: “In his first few days on the job, President Trump had a lot to say about energy pipelines. He wanted them built and, true to his America First philosophy, he wanted them built with domestic steel. “It’s going to put a lot of workers, a lot of steelworkers, back to work,” Trump declared from the Oval Office as he revived the Keystone XL and Dakota Access pipelines — reversing decisions made by Barack Obama. “You will see a level of quality that you’re not going to see when they bring pipe from far distances,” Trump told a GOP congressional retreat. But scrutiny of Trump’s demand shows that his simple-sounding “Buy American” sloganeering runs headlong into actual economic conditions, legal barriers, and basic requirements of governing. Senator says Trump’s mental health is questioned by GOP colleagues from Associated Press: “A Democratic senator claims that “a few” of his Republican colleagues have expressed concern to him about President Donald Trump’s mental health. Senator Al Franken of Minnesota says the concern stems from questions about Trump’s truthfulness. Education Department mocked after misspelling name in tweet from the Associated Press: “The Education Department is getting social media criticism after misspelling the name of a prominent African-American sociologist. Turmoil at the National Security Council, From the Top Down from the NY Times: “These are chaotic and anxious days inside the National Security Council, the traditional center of management for a president’s dealings with an uncertain world. Longtime Trump friend says Priebus is ‘in way over his head’ from the Washington Post: “One of Donald Trump’s longtime friends made a striking move on Sunday: After talking privately with the president over drinks late Friday, Christopher Ruddy publicly argued that Trump should replace his White House chief of staff. 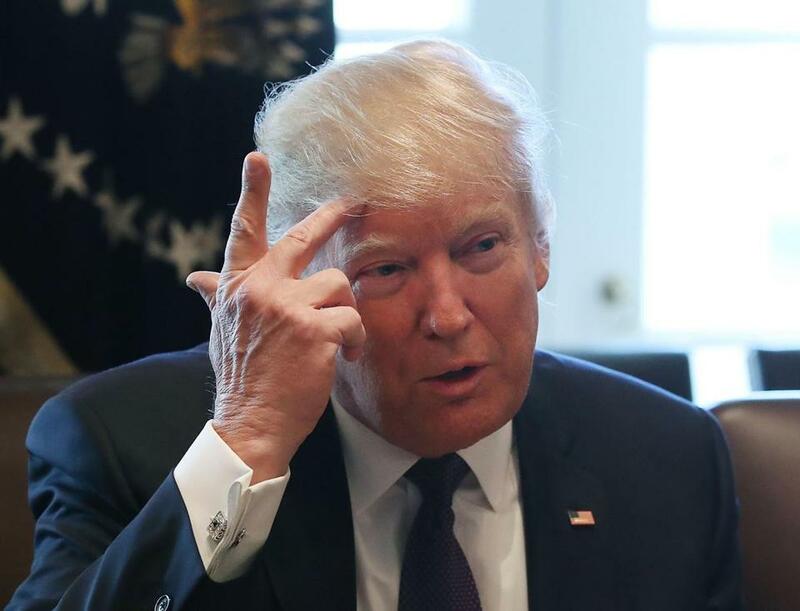 ‘‘A lot of people have been saying, ‘Look, Donald has some problems,’ and I think he realizes that he’s got to make some changes going forward,’’ Ruddy said in an interview. For Religious Right, Success and Access at the White House from the NY Times: “Mr. Trump, a profane, bombastic, thrice-married New Yorker, may not have been the candidate many religious conservatives prayed would win the White House. But the mutually beneficial arrangement he has nurtured with the Christian right is already starting to nudge the government in a more conservative direction. The religious right’s influence is evident in the policies the new administration has prioritized in its first weeks, from Mr. Trump’s clampdown on federal funding that could indirectly support abortion to his directive to give persecuted Christians special dispensation to enter the United States. His pick to fill the vacancy on the Supreme Court, Judge Neil M. Gorsuch, has written opinions favorable to businesses that have religious objections to government mandates. And the White House has told leaders of the movement that the president will select nominees for the lower courts who are opposed to expanding abortion rights. Kellyanne Conway’s dangerous game from Politico: “Kellyanne Conway once again put herself at the center of controversy last week when she went on national television and declared she was doing a “free commercial” for Ivanka Trump’s clothing line, ethics laws be damned. Media snarked, ethics watchdogs barked and even White House press secretary Sean Spicer said Conway had been “counseled” on her behavior. But according to someone who has worked with Conway and knows her thinking intimately, none of that much matters to Conway. She’s taking a long view in her bid to rise in the White House ranks — and she’s performing for an audience of one: President Donald Trump. And so while critics may squawk, what matters most to Conway is that Trump sees her defending him on national television. Anti-Trump wave lifts and worries Democrats from Victoria McGrane in the Boston Globe: “At congressional town hall meetings, on the patchy grass of the National Mall, and in the flood of comments posted on Senator Elizabeth Warren’s Facebook page, it seems painfully obvious: Liberals are getting energized and exercised. They have found a rallying cry in opposing President Trump’s policies on immigration, health care, and just about everything else that comes across his Twitter feed. But a more subtle conversation is taking place among Democrats — particularly those in the Rust Belt states that lifted Trump to the presidency — who are feeling anxious about the tricky balancing act that lies ahead, between harnessing the base’s outrage and being devoured by it. Fired up, ready to go: Thousands of Democrats pack Cobo from the Detroit Free Press: “Michigan Democratic Party spring conventions typically are sleepy affairs filled with party regulars giving speeches and calls to action. In the wake of the election of Republican Donald Trump as president, fueled in part by Michigan voters giving him a 10,704-vote margin of victory and the state’s 16 electoral votes, the state party convention Saturday at Cobo Center was packed with nearly 5,000 Democrats pledging to retake the state that, before Nov. 8, had voted for the Democratic presidential candidate dating to 1992. Jim Webb: Democratic Party Has Moved “Very Far To The Left” from Real Clear Politics: “In an interview on NBC’s ‘Meet The Press,’ former Sen. Jim Webb (D-VA) said that the Democratic Party has moved “very far to the left” over the past few years. James Pindell can be reached at james.pindell@globe.com. Follow him on Twitter @jamespindell, or subscribe to his Ground Game newsletter on politics: http://pages.email.bostonglobe.com/GroundGameSignUp.